Probst flies out (3/14 p.m. US time, 3/15 Philippines time). Ep1: "Survivor Smacked Me in the Chops" (Season premiere) Ep2: "Don't Be Blinded by the Headlights" Ep3: "This Isn't a We Game"
After being joined by the three returnees (Mike Skupin, Russell Swan, Jonathan Penner), contestants have one minute to grab as much supplies as they can, and get on their rafts. 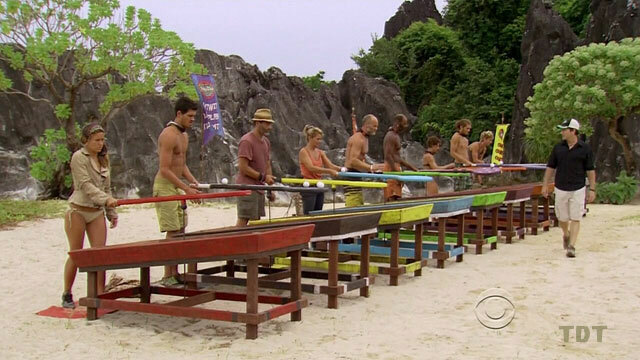 Pairs of contestants race to retrieve paddles, row out to release a crate, then get the crate on the beach to open it and complete a puzzle. 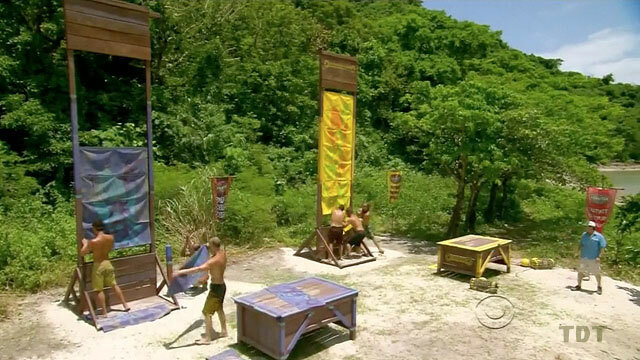 Kalabaw (first) wins immunity + fire-starting kit, Tandang (second) wins immunity and flint. Ep1 RC/IC: "Share the Wealth" - Kalabaw wins, Tandang second. Pairs of contestants pull sleds to retrieve three sets of puzzle pieces, followed by three tetris-piece-like puzzles. Tandang (first) wins immunity + pillows, blankets & tarp, Kalabaw (second) wins immunity and a tarp. Ep2 RC/IC: "Manila Folders" - Tandang wins, Kalabaw second. Ep3: "This Isn't a We Game" Ep4: "Create A Little Chaos" Ep5: "Got My Swag Back" Ep6 "Down and Dirty"
Contestants dive down for eight octagonal puzzle wheels, then solve an eight-letter word puzzle ('TREASURE'). Katie, Dawson, Abi, Lisa sit out. 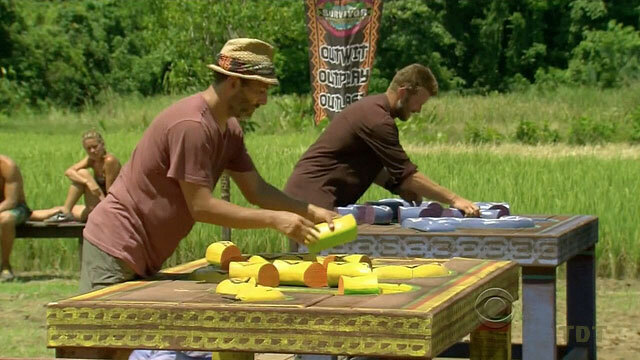 Kalabaw wins immunity + big fishing kit, Tandang wins immunity + small fishing kit. Ep3 RC/IC: "Deep In Thought" - Kalabaw wins, Tandang second. 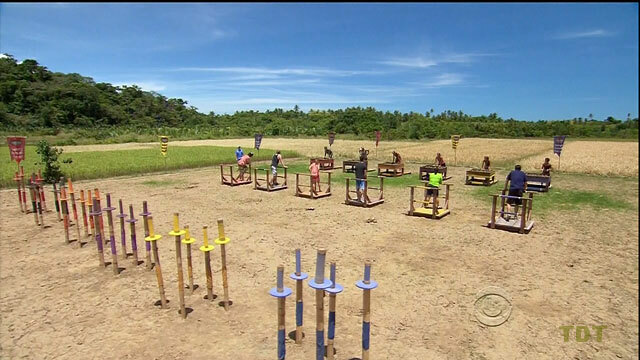 Contestants carry pairs of pots through an obstacle course to put them on posts (six total). Then one player swings a wrecking ball to smash the six pots. Katie, Dawson, Dana, Abi, Lisa, RC sit out. 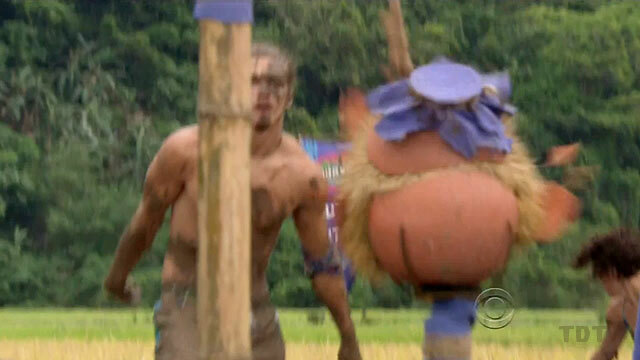 Tandang wins immunity + steaks/spices, Kalabaw (2nd) wins immunity + a tarp. 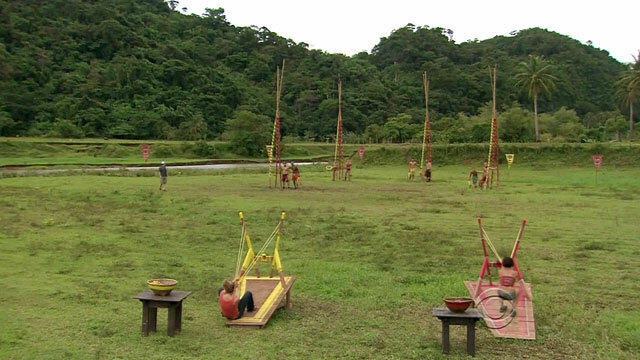 Ep4 RC/IC: "Swing Break" - Tandang wins, Kalabaw second. Contestants pair off in bouts to knock a statue from their opponent's hand. Tandang (now with Malcolm) wins coffee, muffins and cookies. Dana leaves the game (semi-voluntarily), suffering from severe dehydration. 13 players remain. Tribes go through water, over berms, untie ropes to lower a drawbridge, chop through a rope to release puzzle pieces, then retrieve 19 lettecal-red pieces (from 175 total) to complete a puzzle ('Live to play another day'). Ep5 IC: "Thrash, Splash & Bash" - Tandang wins. 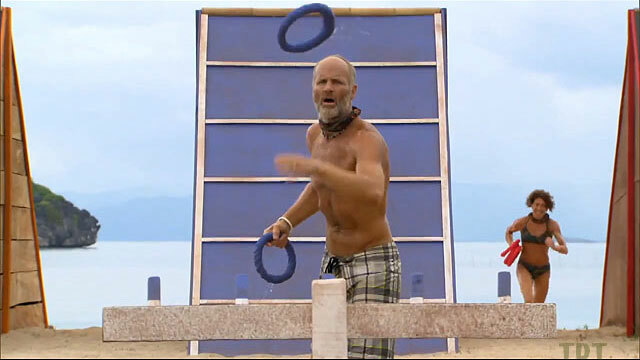 Ep6: "Down and Dirty" Ep7: "Not the Only Actor On This Island" Ep8: "Dead Man Walking"
Penner, Carter and Denise bring Skupin, Pete and Lisa to a stalemate in the first heat of a muddy ball-roll. Penner negotiates with Skupin: Kalabaw gets reward feast (plus letters from home), Tandang gets Kalabaw's rice. Lisa and Denise launch balls with slingshots, to be caught in nets by remaining tribemates (except Abi and Skupin). Tandang wins again. Ep6 IC: "Philiping Out" - Tandang wins. Contestants compete individually to hold a reel with a string wound around it, to prevent a bucket attached to the other end from smashing a plate. 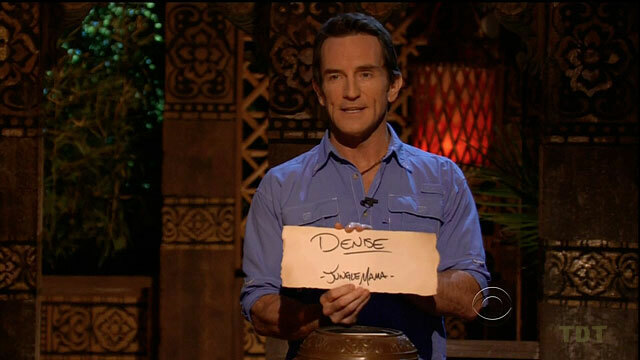 Carter and Denise each win immunity. Ep7 IC: "Wrist Assured" - Denise and Carter each win. In teams of five, contestants take turns swimming out to unhook fish traps, then are pulled back in by their team. After digging up a key, puzzle banner pieces are taken from the fish traps and raised on a scaffold. Lisa, Denise, Penner, Jeff, and Malcolm win a picnic on a riverboat. 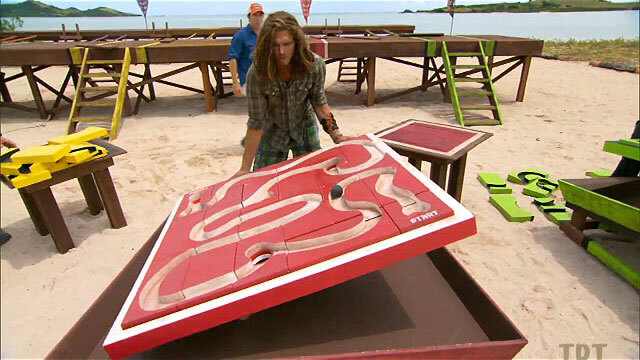 Ep8: "Dead Man Walking" Ep9: "Little Miss Perfect" Ep10: "Whiners are Wieners" Ep11: "Hell Hath Frozen Over"
After an initial round in which the contestants gather puzzle bags while going over and around obstacles, Pete, Jeff, and Penner move on the final round: a snake puzzle. Penner wins. Ep8 IC: "Snake in the Grass" - Penner wins. In teams of four, contestants cross a muddy/rice-y obstacle course, retrieve one ball bag each from a mud pit, then shoot all 12 balls into a basket. Carter, Penner, Malcolm, Denise win a gift-bearing trip to a local village for dinner. 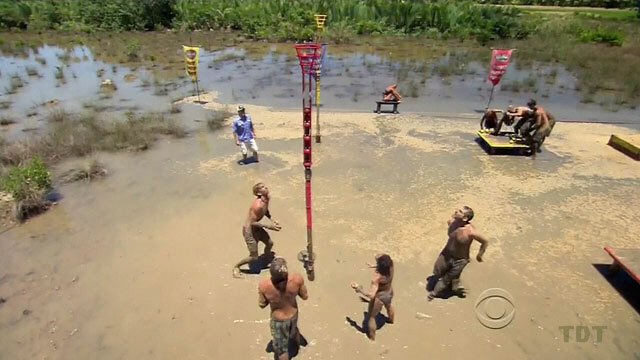 Ep9 RC: "Muddy Waters" - Carter, Penner, Malcolm, Denise win. Contestants must roll six balls out and catch them in divots on a long paddle. Mike Skupin wins easily. Ep9 IC: "Paddle Out" - Skupin wins. 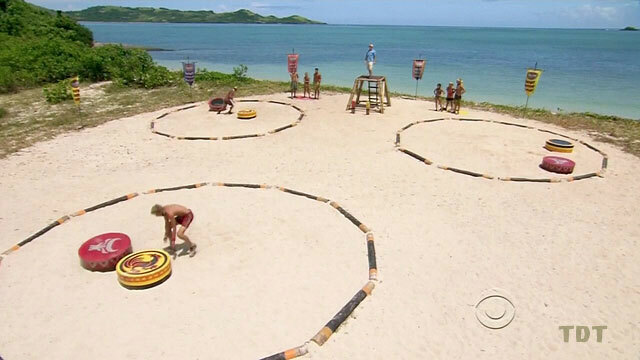 In teams of four, survivors race to flip over three discs, while an opponent tries to flip theirs. Malcolm, Carter, Pete, and Abi-Maria win a spa getaway. A three-stage challenge in which contestants must push a float along a twisted rope. Carter, Skupin, Denise, Penner, Malcolm make second stage. Carter beats Skupin and Denise in the final stage. Ep10 IC: "Push Your Luck" - Carter wins. Denise & Skupin each immediately blow all $500 on food. Abi-Maria goes all-in on the IC advantage. Carter trades a 'baked potata' for rice & beans for the tribe. Everyone wins. Ep11 RC: "Survivor Auction" - everyone wins. Abi-Maria buys IC advantage. Ep11: "Hell Hath Frozen Over" Ep12: "Shot into Smithereens" Ep13: "Gouge My Eyes Out"
A three-stage ropes-obstacle course, with each round preceded by trivia. A wrong answer forces the player to carry 5% of their body weight. Abi-Maria uses advantage to proceed directly to final round (of three). All but Lisa advance to second stage. Carter and Penner lose to Abi-Maria at the final stage. 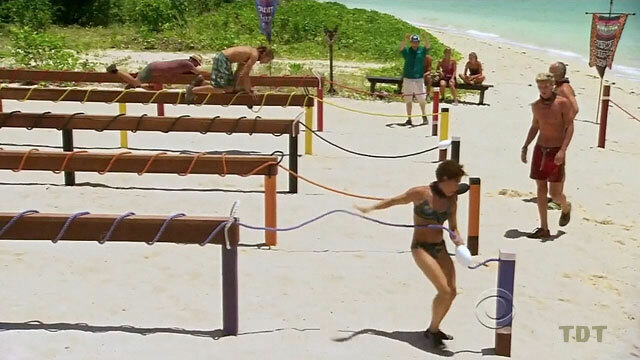 Ep11 IC: "Brains and Brawn" - Abi-Maria wins. Contestants are paired with loved ones. 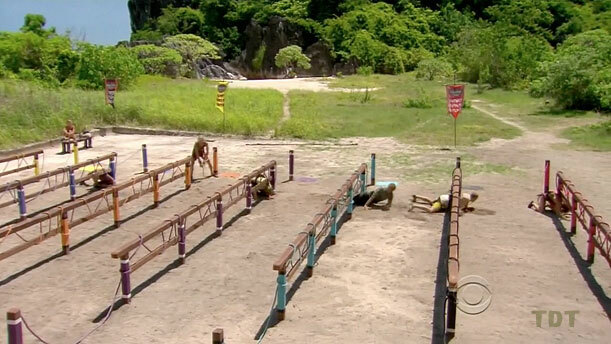 Contestants fling muddy balls to loved ones, who must knock over five pieces of bamboo. Malcolm and his brother Miles win. Malcolm picks Skupin (& his son, Michael) and Lisa (& her brother, Justice) to join them on overnight stay in camp. 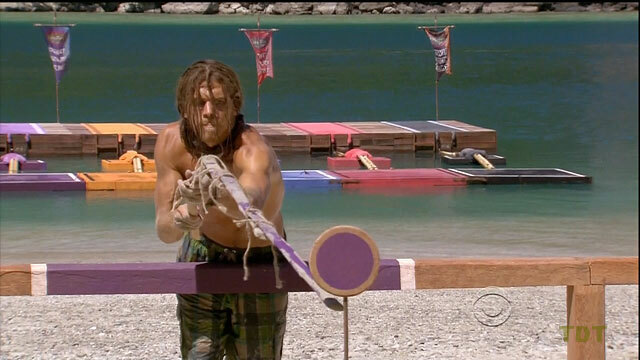 Contestants walk across a plank to a dock, fish up three bags of stick using a rope/grappling hook, then swim to the beach to construct a pole with sticks and twine to push a lever and release a flag. Malcolm wins. Ep12 IC: "Fish and Game" - Malcolm wins. Contestants run up a ramp, go down a slide, run to water to retrieve two bags of rings. Then toss 5 rings onto pegs. Skupin wins, takes Malcolm & Lisa on a whale shark-watching trip. Contestants cross a rope bridge, picking up puzzle pieces, then complete a table maze puzzle and run a ball through the track formed. Malcolm makes a dramatic come-from-behind win. Ep13 IC: "One Track Mind" - Malcolm wins. 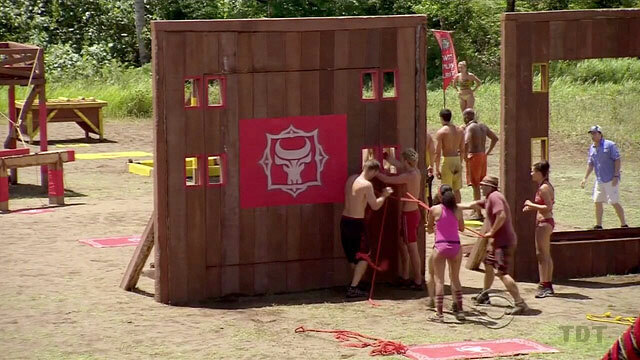 Contestants cross an obstacle course to pick up three puzzle bags, then complete a vertical dragon puzzle. Malcolm wins advantage in the IC. Ep14 F4 IC: "The Ball Drop" - Skupin wins. 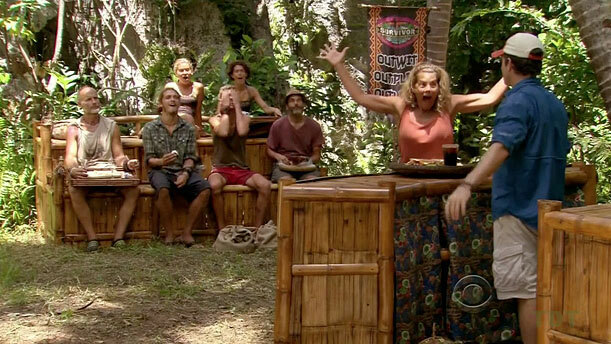 Despite bitter jury questions, Denise wins, 6-1-1, over Skupin and Lisa. 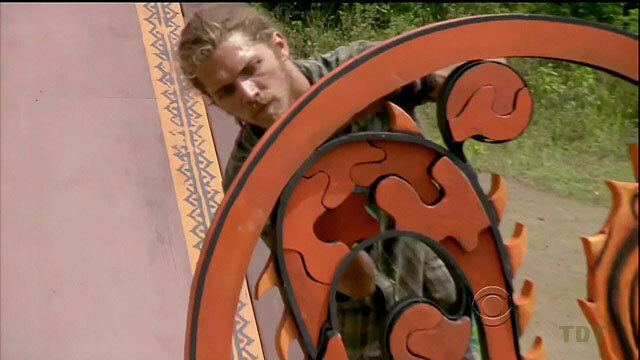 Final tribal council, jury votes on Final 3. Departure. Contestants fly back to the U.S.